Fig. 16-8. Sun Angle Measurement Geometry for a Very Asymmetric Nutating Spacecraft See text for explanation. 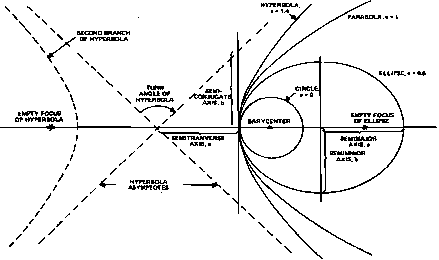 The average of the measured Sun angles will be somewhat different from the nominal Sun angle, /}, as shown in Fig. 16-8. The dotted curve on Fig. 16-8 is a small circle of radius, fi, centered on the sensor slit and tangent to the body z axis. At points C and E, where this curve intersects the path of L, the nominal and measured Sun angles will be equal: between C and E inside the nominal Sun angle curve, [im > 18; outside the nominal Sun angle cone, /3m < fi. A similar construction is possible on Fig. 16-7. It is clear from the location of points C and E that the average measured Sun angle will be less than jS whenever the Sun angle is less than 90 deg. Similarly, the average fim will be greater than j8 whenever the Sun angle is greater than 90 deg. Normally, this effect is small and may be masked by the granularity of the Sun angle measurement. In the extreme case in Fig. 16-8, the average (im is about 2 deg less than /8. For a symmetric spacecraft, the path of L in Figs. 16-7 and 16-8 is a small circle of radius 0 and the maximum and minimum values of Pm are ¡i + 6 and fi — 0. In this case, Rp = bfim/20 = 1. For asymmetric spacecraft, Rp is a function of 0mx, fi, the moment of inertia tensor, I, and the azimuth, of the sensor slit plane. To determine the functional dependence of Rp on the spacecraft parameters, we define the second intermediate variable, Rg, by siniL..
where 0 is the nutation amplitude at phase if> as defined in Fig. 16-7.